There is nothing like the peace and satisfaction that comes from remaining faithful to your post of duty, even in the midst of mistakes, failings, misunderstandings, and conflict. While Private Ray Cote was in Germany with the 12th Infantry after World War II, he was put on sentry duty to guard some pontoons on the banks of the Rhine River. Because of an oversight, he wasn’t relieved for six days. What kept Private Cote faithful? He was totally committed to the cause for which he was serving. He would have rather died than disobey his order to quit post only when properly relieved. 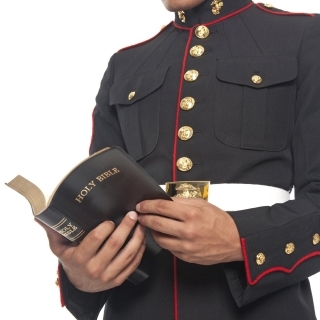 What is a Christ-follower’s post of duty? Our heavenly assignment is that we would, by faith, establish an intimate, knowledgeable, love affair with Jesus through diligent personal study, application, and practice of His Word (see 2 Timothy 2:15; 2 Corinthians 5:14-15; James 1:22; 1 John 2:5-6). The result of persistent faithfulness to this post of duty is an ever-brightening, effectual communication of the truth about God’s loving character. By His grace, we will be able to influence others to personally embrace the messages of the Three Angels found in Revelation 14:6-12 (see 1 John 4:8; 2:5-6; Proverbs 4:18). Fear none of those things which thou shalt suffer: behold, the devil shall cast some of you into prison, that ye may be tried...be thou faithful unto death, and I will give thee a crown of life (emphasis added). Looking down through long centuries of darkness and superstition, the aged [apostle John] saw multitudes suffering martyrdom because of their love for the truth. But he saw also that He who sustained His early witnesses would not forsake His faithful followers during the centuries of persecution that they must pass through before the close of time (588, emphasis added). This kind of faithfulness to the call of God may cause some outside observers to regard us as having a “hole in the head.” In fact, Inspiration tells us in Fundamentals to Education that, “when we reach the standard that the Lord would have us reach, worldlings will regard Seventh-day Adventists as odd, singular, strait-laced extremists” (289). But none of these things move me, neither count I my life dear unto myself, so that I might finish my course with joy, and the ministry, which I have received of the Lord Jesus, to testify the gospel of the grace of God (Acts 20:24, emphasis added). For God hath not given us the spirit of fear; but of power, and of love, and of a sound mind. Be not thou therefore ashamed of the testimony of our Lord...but be thou partaker of the afflictions of the gospel according to the power of God...For the which cause I also suffer these things: nevertheless I am not ashamed: for I know whom I have believed, and am persuaded that he is able to keep that which I have committed unto him against that day (2 Timothy 1:7-8, 12, emphasis added). When Christ our Savior was here on Earth, there were many distractions to finishing the assignment God the Father had called Him to complete: unbelieving relatives, misunderstanding disciples, and religious leaders out to destroy His ministry. But in spite of what appeared to be overwhelming odds against Him, Christ held to the post of duty, His mission of mercy, to which His Father had sent Him. Father into Thy hands I commend My spirit (Luke 23:46). Even when we desire to be faithful and obedient to the end, how can we develop such commitment and loyalty to God’s cause? The only way to remain faithful even in the face of rejection and persecution is to spend daily time beholding Christ through His Word. We must let the Holy Spirit transform our hearts (see 2 Corinthians 3:17-18). Let the repenting sinner fix his eyes upon “the Lamb of God, which taketh away the sin of the world” (John 1:29); and by beholding, he becomes changed. His fear is turned to joy, his doubts to hope. Gratitude springs up. The stony heart is broken. A tide of love sweeps into the soul. Christ is in him a well of water springing up unto everlasting life. When we see Jesus, a Man of Sorrows and acquainted with grief, working to save the lost, slighted, scorned, derided, driven from city to city till His mission was accomplished; when we behold Him in Gethsemane, sweating great drops of blood, and on the cross dying in agony——when we see this, self will no longer clamor to be recognized. We shall be willing to be anything or nothing, so that we may do heart service for the Master. We shall rejoice to bear the cross after Jesus, to endure trial, shame, or persecution for His dear sake (439, emphasis added). Precious friends, Jesus is inviting us to humbly cooperate with the work of His Holy Spirit to give us His courage, His fortitude, and His faithfulness to the post of duty—the assignment to which He has called us (John 17:18; 18:37). We accept this invitation by choosing in faith to set aside some time each day to contemplate our Master’s life of service and sacrifice. Let your mind dwell upon the exemplifying experience of our faithful Friend, Saviour, and Lord, the Author and Finisher of our faith. It would be well for us to spend a thoughtful hour each day in contemplation of the life of Christ. We should take it point by point, and let the imagination grasp each scene, especially the closing ones. As we thus dwell upon His great sacrifice for us, our confidence in Him will be more constant, our love will be quickened, and we shall be more deeply imbued with His spirit (Desire of Ages 83.4). Some years ago H.M.S. Richards wrote a very insightful nugget entitled, Keep at Your Work. The Lord has given to every man his work. It is his business to do it and the devil’s business to hinder him if he can. So surely as God has given you a work to do, Satan will try to hinder you. He may present other things more promising. He may allure you by worldly prospects; he may assault you with slander, torment you with false accusations, set you to work defending your character, employ pious persons to lie about you, editors to assail you, and excellent men to slander you. You may have Pilate and Herod, Ananias and Caiaphas all combined against you, and Judas standing by you to sell you for thirty pieces of silver; and you may wonder why all those things come upon you. Can you not see that the whole thing is brought about through the craft of the devil, to draw you from your work and hinder your obedience to God? Keep about your work. Do not flinch because the lion roars; do not stop to stone the devil’s dogs; do not fool away your time chasing the devil’s rabbits. Do your work. Let liars lie, let sectarians quarrel, let corporations resolve, let editors publish, let the devil do his worst; but see to it that nothing hinders you from fulfilling the work that God has given you. He has not sent you to make money. He has not commanded you to get rich. He has never bidden you to defend your character. He has not set you at work to contradict falsehood which Satan and his servants may start to peddle. If you do those things, you will do nothing else; you will be at work for yourself and not for the Lord. And lest you grow weary and lose heart, think of Jesus, who for the joy that was set before Him, endured the cross, despising the shame, and is set down at the right hand of the throne of God for you and me (Hebrews 7:25; 12:1-4)! Therefore, “Be strong and of good courage, and do it: fear not, nor be dismayed: for the LORD God, even my God, will be with thee; He will not fail thee, nor forsake thee, until thou hast finished all the work for the service of the house of the LORD” (1 Chronicles 28:20).